Nokia TA-1054 is Approved in China; Will it Launch as Nokia 9? - Playfuldroid! Nokia TA-1054 is Approved in China; Will it Launch as Nokia 9? A mysterious Nokia phone with model number of TA-1054 has received 3C certification in China. Speculations have it that this phone may launch as Nokia 9 flagship phone. 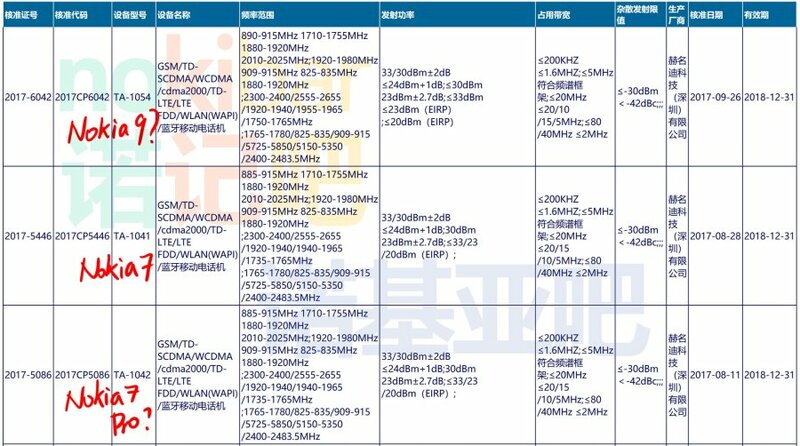 In September, Nokia TA-1041 and TA-1042 were certified in China. The TA-1041 was launched as Nokia 7, but the Nokia TA-1042 is still under the wraps. Rumors suggest that it could be a variant of the Nokia 7. However, the newly found Nokia TA-1054 seems to be the upcoming Nokia 9 as there aren’t any Nokia branded phones waiting to be unleashed. Previous reports have revealed that the Nokia 9 would be a better specced flagship than the Nokia 8. Its leaked renders have already surfaced which indicate that the smartphone would be arriving with dual edge curved display. It is expected to sport a bezel-less design. Like other flagships of 2017, the Snapdragon 835 SoC is rumored to power the Nokia 9 phone. It may arrive in 6 GB and 8 GB RAM options and it is likely to feature a native storage of 128 GB. The rear side of the phone is expected to house a dual camera system. The rumor mill has also revealed that the Nokia 9 would be launched with a price tag of 749 euros in European markets.